ASHRA is an Arizona state-wide organization with volunteers in the Phoenix area, Flagstaff, and Tucson. We work with several other agencies around the state as well. Every penny that ASHRA raises is used to support our rescue efforts and the Siberian Huskies in our care. We have lots of expenses, including veterinary care, sterilization, vaccinations, food and more. There are several ways you can help! Any donations to ASHRA will directly support our rescue efforts and the Sibes in our care. Since we are a 501(c)(3) Non-Profit organization, every donation is also tax deductible! The easiest way to donate is via Paypal - just click the button below! We also take donations of items which we then sell in ASHRA benefit garage sales. These donations are also tax deductible. While we often hear from people interested in volunteering their time to help ASHRA, our single greatest need is foster homes. The more foster homes we have the more dogs we can save, and we only have a few foster homes right now. Please.. if you are at all interested in fostering a Siberian Husky in need, and you live in Arizona, learn about our foster home program here. Thank you! Note: The last couple of years have been among the worst ever for rescues in Arizona. Foster space is at a premium and we are even more desperate than usual for foster homes. Please help if you can! We have opened an on-line store, where you can purchase a wide variety of products that benefit our rescue. Products, such as t-shirts and coffee mugs, feature great Siberian Husky artwork from Debra Jones. We have added quite a few new products, with even more to come - check it out! Debra Jones, a wonderful Arizona artist, is helping out a good cause - ASHRA! Please visit her web site for more information, and let her know we sent you. Updated! 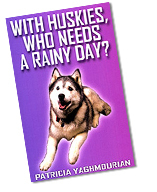 Patricia Yaghmourian's wonderful book, "With Huskies, Who Needs a Rainy Day? ", was revised and reprinted in 2009. The book tells the story of a group of huskies, who relate their escapades and adventures to the reader. The revision includes some of Lily's stories, who was rescued by the author and now graces the cover. A must for the Husky enthusiast, but a book for all dog lovers. Please visit her web site for more information - and ASHRA receives a portion of every sale! Please note: It is the duty of all of our volunteers to respond as quickly as possible to all inquiries. However, since we are a volunteer-only organization, most of us have full-time jobs and cannot always respond immediately. Please understand there may be a short delay in our response. We thank you for your patience, and your interest in ASHRA. ASHRA is a 501(c)(3), Non-Profit, Volunteer-run Organization that rescues Siberian Huskies and places them into Qualified Homes, as well as educates the public on the special needs of the Siberian.